Baba Cesare has left his ashram near our village of Longoio, Italy for his ashram in Hampi, India. The winter chill was already beginning to have its feel upon him and, like a swallow, he has flown south. I’ve already written about Baba in my post at https://longoio2.wordpress.com/2016/08/27/baba/ . Together with his friends, disciplines and acolytes we wish Baba a safe journey back to his spiritual homeland. At the same time I feel that Baba has left a great spiritual strength for us to nurture in our hills. Rarely have I met someone so much in pursuit of that which is higher than any of us – that o so multifariously difficult-to translate-word of eastern philosophy known as Dharma. Simply put Dharma is the right way of doing things and the carrying out of duties according to this right way. What is the right way? 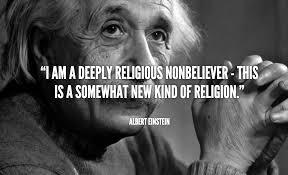 Once Baba said to me ‘I know that I don’t know’. And sometimes it comes to me that perhaps I don’t know that I do know. Rightness is, above all, liberty from attachment and from anything that weighs one down with material preoccupations. Are my worries a matter of life and death? Only thinking about Dharma should put me right about that. There are many books dating back to the most ancient of sages which lay down the right way of doing things but only by carrying out one’s life in a veracious manner will convince and, above all, feel upon the pulse, the greatness of Dharma. To harmonise oneself with the universal law of Dharma one has to understand the rule of Karma, which is equally universal in mankind. It’s inherent in such biblical statements like ‘as you sow so shall you reap’, from Galatians 6.7, from such scientific statements as cause and effect and from such human interfaces as action and reaction. Cutting a cluster of grapes from the vineyard will cause it to fall into a basket. Good actions will develop one, bad ones can only destroy one in the end. Virtue and sin in the Christian eschatology – heaven and hell both internally and externally are all there for one to see, feel, believe and practise. 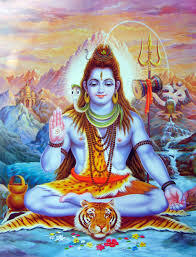 Without the third Hindu concept of Artha it would be impossible for most people to practise good Karma and thereby enable one’s own Karma to draw closer and harmonise with Dharma. For Artha is the means of life, the actions which enable one to survive in the world whether it is undertaking powerful take-over business bids or street-begging. It also means clarity, the ability to be able to look after oneself without harming others. Without the proper conduct of Artha, Karma and Dharma one will constantly be an anguished soul suffering pererenially in a Dantean hell with no means of escape at any time . The ‘Itness’ of it is both very simple and very complex. The simplicity is in the clarity and apparent obviousness of it. The difficulty is in the deviousness and obfuscation of the human psyche. There are so many ways to be evil but only one way to be good. Lies have to be remembered. The truth has no need to be remembered. It just is. Nothing is hidden – not even the most devious falsehood. Good action heals, bad action hurts. No action disappears without trace. It is kept in the memory of the Godhead. “Do unto others as you would have them do unto you”. Dharma is truly the Golden rule. is built by our thoughts, and is made up of our thoughts. like the wheel of the cart follows the foot of the ox. For hate is never conquered by hate. Hate is conquered by love. but those who do realize this, end their quarrels at once. We all hope so much to see you next year Baba Cesare (or maybe before in India?). 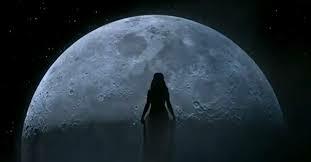 You have both brought me down to earth and into heaven by your presence, your all-seeing eye, your calmness and your words. God bless! 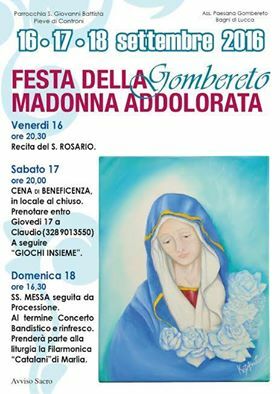 On Thursday 15th from about 8 pm there will be dancing and singing at Baba Cesare’s Ashram near Guzzano. (See my post on him at https://longoio2.wordpress.com/2016/08/27/baba/ ). Baba invites all devotees and all those who are on their life journey’s search to attend. Baba, as many will know, is a devotee of Lord Shiva (Trans: ‘the auspicious one’) and will shortly leave for his ashram in Hampi, India. On Saturday 17th from 3 pm to 8 pm at Ennio Manfredi’s ‘Campo Natura Stella del Mattino’ (to reach follow the track up from where you can get good drinking water from the Refubbri stream on the way from Bagni di Lucca to Guzzano) there will be a Celtic celebration in praise of the full moon conducted by ordained priests and priestesses and following ancient rites of protection from evil and negative spirits. Activities include walks to fountain sources, games, refreshments and aperitifs, community and drum circles (do bring a musical instrument like a flute or drum if you have one) all set in a convivial and friendly setting in the depths of the wonderful woods surrounding us. Hoping to see those of you who are in the area participating in at least one of these beautiful events. A Flying Saucer Has Landed! It’s not actually a flying saucer, of course, but a drone picked up from our local discount food store, Penny Market, upon “prenotazione” i.e. if you book one. (The offer’s now closed). The price was around eighty euros. 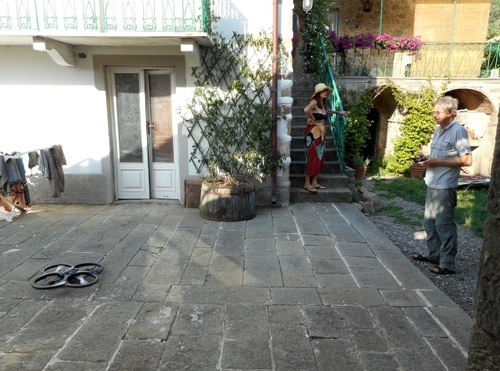 I tried out the drone with the assistance of Guzzano’s resident aviator and managed to crash it against a drainpipe. As the framework of the drone is made out of polystyrene the damage was easily repairable with a bit of sticky tape. What I did discover, however, was that it requires almost extra-terrestrial skill to manipulate the drone correctly since its controls are highly sensitive and the drone itself is subject to atmospheric change like wind directions etc. 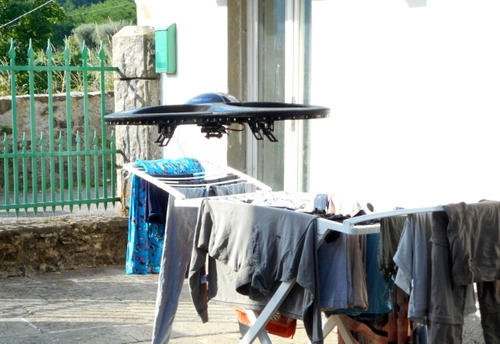 With considerable dexterity the aviator managed to steer the drone onto a towel on his washing rack. I’m looking forward to the time when his skills will increase to the point of being able to manipulate the vehicle so that it can descend down from the kitchen carrying perfectly balanced glasses of gin and tonic. The penny market drone has a built in video/still camera and, therefore, could be used for several useful applications which I would divide into four areas. First, it could greatly enhance one’s photographic album by providing overviews of village, sites and other places one visits. Second, it could be used for building work, roof inspections and such like. Third, it could have a security value by checking up on suspicious neighbours although, clearly, this might create privacy issues. Drones have borrowed their terminology from male honey bees which, unlike female worker bees, do not have a sting and do not join in collecting pollen. 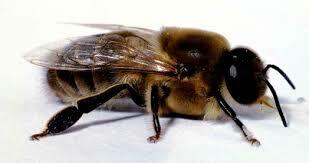 The drone bee’s main function is, in fact, to mate with a fertile queen. 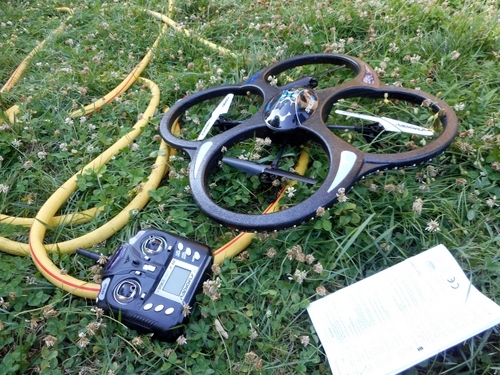 The correct name for a non-bee drone is an UAV or Unmanned Aerial Vehicle. Unlike missiles, UAVs are supposed to be returnable and I thought that perhaps the oldest UAV must have been that bright invention of the Australian aborigine, the boomerang. In the nineteenth century Austria sent UAVs in the form of balloons to bomb Venice during the 1866 war. 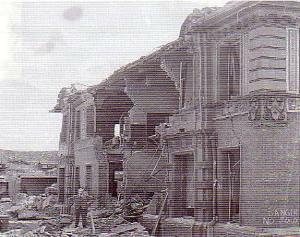 The real breakthrough, however, was with the V1 flying bomb, known by brits as a “doodlebug”, one of whose achievements was to demolish the swimming pool and boiler block at my old school in Dulwich. 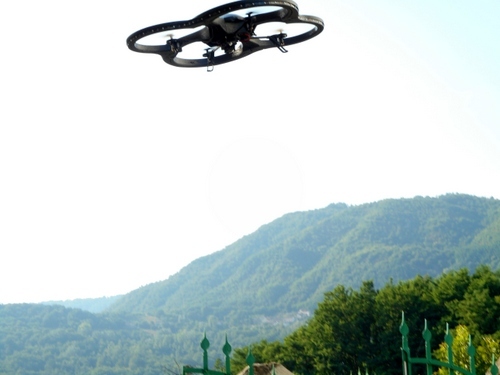 The possibilities of using UAVs’ or drones are endless. For example, last year, a drone successfully found an old boy with dementia who had gone missing for three days. Although I haven’t quite reached that stage yet I think our new toy could be useful for locating any of our cats that might go missing as was the case with Cheeky last year. Here is a video of the drone performing a couple of days ago. There is also a video from the drone itself! Anyway, I won’t drone on any further and instead enjoy yet another scorchingly hot day. In January 2013 an earthquake hit our part of the world. 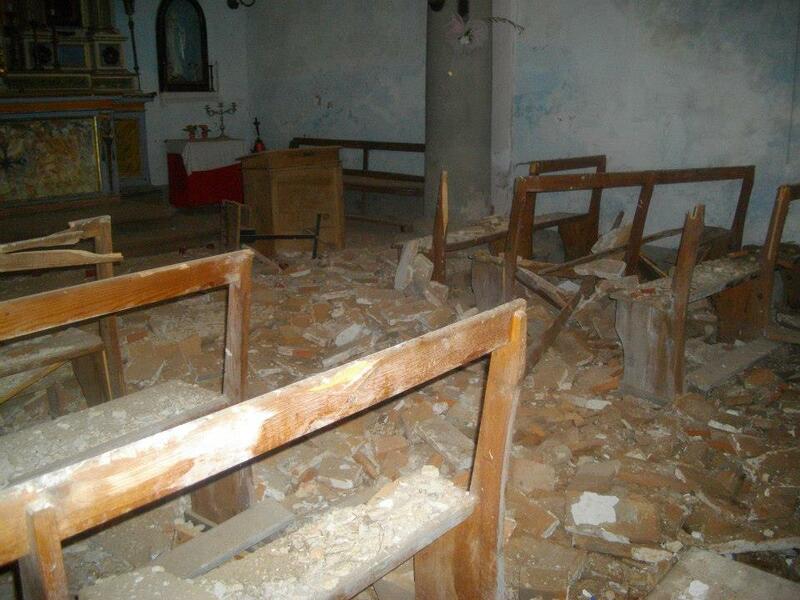 Although we all felt its impact, no one was hurt and damage to property was slight except in one case: that of the “Chiesa Del Poggio” (church on the hill) at Guzzano, the next but one village to Longoio. A group, which included Don Franco the local parish priest, examined the building and found that large chunks of the roof, including vaulting and beams, had fallen down, spreading white dust and debris in the interior, now open to the skies. The church is dedicated to the Madonna of the snowfall and Don Vitali said that, indeed, it seemed as if snow had fallen into the church. The Madonna of the snowfall celebrates an event which occurred in Rome around 400 AD when on August 4th snow fell, defining precisely the contours of the ground plan of what would become the world’s greatest Marian basilica, Santa Maria Maggiore. Returning to Guzzano’s own Madonna Della Neve: what was to be done about the church? Used but once a year, far too big for the present population, on top of a hill in the middle of a wood, approachable only by a twenty minute walk (unless one had a 4 X 4 car) and with no parking, there appeared to be no hope for the building. It seemed surplus to requirements and destined to progressive decay like (just to pick one local example) San Rocco, at the entrance road to Vetteglia. Any money available would, anyway, be allocated for more urgent tasks like making safe the roads, shoring embankments against further landslides (Italy is Europe’s most at-risk country from land movements with eighty per cent of its surface vulnerable) and strengthening river levees. 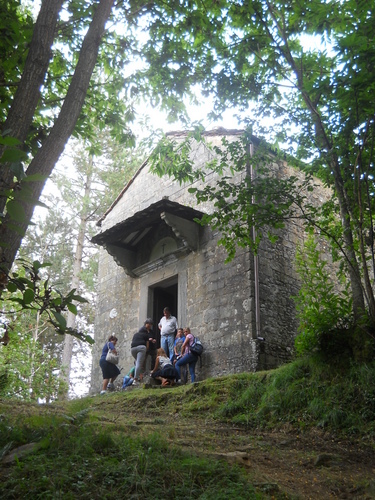 There was one person, however, Claudio Gemignani, from Gombereto (already very active in that village and chief coordinator of many projects there including the restoration of its own chapel and the organization of its mediaeval Festa) who decided that Guzzano’s church on the hill could, in fact, be reinstated. He managed to find money: five thousand from Lucca’s curia, five thousand from the Luccans’ abroad association in the USA and five thousand from others sources, making a total of fifteen thousand euros. In eighteen months the results showed to perfection and a Mass was held there yesterday, with a large congregation present, on the feast of the Madonna. A thing of beauty is a joy for ever and the church certainly has its own special beauty features. First, its position in the centre of a thick wood and at the top of a hill which (for me) evokes passages from Malory’s Arthurian romances. Second, its size: there are aisleless bays separated by five beautiful arches, the one nearest the altar flanked by gorgeous classical Tuscan columns in Pietra Serena – part of the ceiling here still retains its mediaeval lozenge-painted beams, formerly covered by later vaulting which collapsed after the earthquake, and have now been revealed after hundreds of years. Third, the magnificent main altar dating from the sixteenth and seventeenth centuries with very attractive painted panels. An ecclesiastical building isn’t there just for devotees – it’s there for the community and (even for unbelievers) represents cohesiveness and unity in that community. A neglected church is truly a sorry sight. There will be sceptics who think that money should not be wasted on things which they feel are either redundant or under-used. True, the church is rarely used but I feel that it could be now used for such activities as social evenings, concerts, recitals, readings as many other churches in the area are. There might even be space for a Guzzano festival (although something will have to be done about access to the building by less able people). if you’d like to help.